Take 10% off your purchase of $100 or more. Take 15% off your purchase of $250 or more. Take 20% off your purchase of $500 or more. Take 25% off your purchase of $1000 or more. Use the promotion code SAVEMORE to receive the offer. Source of the information is Pottery Barn. 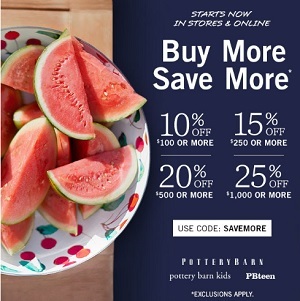 More details available at any U.S. Pottery Barn store location or U.S. Pottery Barn online. (total: 1092)G.H. Bass & Co.